This tutorial assumes that you have XAMPP 1.7.3 installed. The procedure should be the same for other versions of XAMPP. A XAMPP installation procedure for Windows XP can be found here. 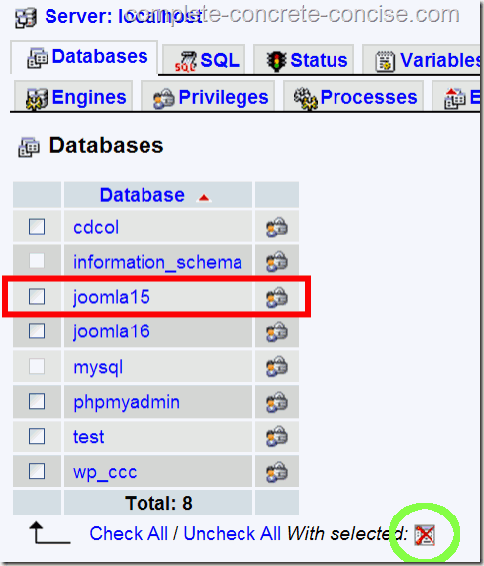 (1) Enter http://localhost/phpmyadmin into your browser’s URL field. This will bring you to the phpmyadmin main page. (2) Click on the Databases tab. This will bring you to a page listing all your databases. cdcol is the cd collection sample database that comes with XAMPP – it is safe to delete, if you like, just be WARNED that the application will no longer work. 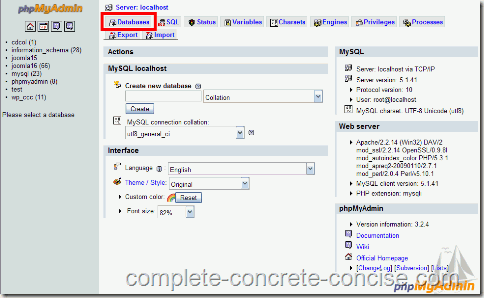 phpmyadmin is essential for phpmyadmin to run correctly. Do NOT delete it. Unfortunately, it is possible for you to select this – DON’T. All other databases are the ones you created and are safe to delete if you wish. WARNING: deleting a database will render the application it was created for inoperable. (4) Confirm you wish to delete the databases listed and click on Yes. The term drop is used with databases because, typically, they do not actually delete the database or fields or records, but rather mark them not to be used, i.e. dropped from use.